Kayflow, the rainwater, underground and soil systems specialist, has launched a new high strength, high volume guttering system, the SuperDeep 170. It has been designed to handle many times more rainwater than standard guttering systems. With four of the top five wettest years occurring since the millennium, and data revealing that the frequency of extreme rainfall in the UK may be increasing, the SuperDeep 170 is raising the benchmark for guttering systems. Recommended for fixing at 600mm intervals, each fascia bracket is able to carry a weight of 125kg, that’s around 19.5 stone! With a market leading flow rate of around 10 litres per second, the SuperDeep 170 has the capacity to carry over 10 times more water than a standard half round gutter and at least five times more water than a standard deep system. The strength of the SuperDeep 170 system comes from its carefully designed structure and superior wall thickness. The Super Deep 170 fittings are designed with strength in mind and are positively fixed, including the 90° angle which has been produced in external and internal formats. This increases the strength of the system and provides additional support in the areas where it is needed most. Kayflow has co-extruded the SuperDeep 170 gutter profile so that the inner face is white with either a black or grey outer skin. 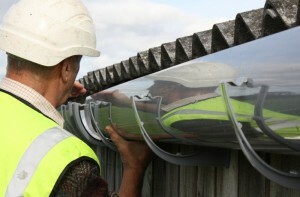 This helps to deter heat build-up, a common enemy of large guttering systems due to the expanse of material. The white inner will help to reduce expansion within the system thus minimising the risk of broken seals. Kayflow’s SuperDeep 170 is ideal for large commercial developments like superstores, hospitals, schools, and factories; buildings that have large roof areas. Due to the capacity of the system it can even reduce the number of downpipes needed. The Kayflow SuperDeep 170 guttering system comes with a 10 year guarantee and is Kitemarked. The Kayflow standard rainwater products are available in round, square, deepflow and ogee systems, and in a range of colours; white, black, brown, grey or caramel. They are also compatible with many other systems. The Kayflow offer also includes half-round and ogee cast iron effect options in black with specially moulded components that closely reflect the traditional detailing of cast iron systems. Both systems carry a 10 year guarantee. Soil ranges come in high gloss finish, are easy to fit and are compatible with many other competitor systems. Kayflow’s durable and impact resistant underground systems come in both 110mm and 160mm diameters and are fully tested to BSEN 140-1:1998 PVC-U underground drainage systems. For more information please visit www.kayflow.co.uk . For Literature and POS material; or if you’re interested in becoming a Kayflow stockist please contact a member of the team on 01827 317 200.